It’s not just because of them getting swept by the Washington Wizards in embarrassing fashion. I haven’t been in love with this team for the past two seasons. Their 49 wins weren’t all that impressive to me. They have been in what’s clearly the worst division in the entire NBA, and they’ve feasted off an awful Eastern Conference. The Raptors this season had a 15-21 record against teams with a record of at least .500 and 34-12 against teams below .500, including an 11-5 division record. We all like to talk about who’s a number-one type of player and who’s a number-two type of player. Well, the Raptors certainly don’t have a number-one, and I don’t think they really have a number-two either. DeMar DeRozan and Kyle Lowry are nice players, but neither should be the second best player on a championship contending team. Obviously Toronto is far from a title contender, but I think it’s safe to assume that every team in the league strives to win an NBA championship and neither of those two guys have what it takes to be a star player on a contending team. They are another team with some nice cap flexibility as they sit at $48 million for next season. Expected to be about $19 million under the salary cap. They have the 20th pick in the draft so that number should be about 17.5, enough to sign a really nice player. But they’ve got a few questions to answer about their own guys. Amir Johnson is an unrestricted free agent. Let him walk. Johnson isn’t worth what he’ll ask for. Even if the price is eight million, use the money elsewhere. Lou Williams, Sixth Man of the Year, also an unrestricted free agent. Let him walk too. Lou Will is a solid player, always has been. But he is what he is. I’d rather spend my money on upside or use the full amount to potentially land a star-level player. Paul Millsap and Greg Monroe are two players I’d target if I were Toronto. With their remaining salary I think landing Monroe is more likely, Millsap may look for a bit more money and is much more likely to stay with his current team, Atlanta. Monroe is an offensive skill player that I believe this team needs who can play both the center and power forward positions. Their current big man, Jonas Valanciunas is a decent player, but hasn’t progressed to the level some expected he would. The contract of Landry Fields finally expires, the most overpaid player in the entire league. His $8.5 million comes off. So does Tyler Hansbrough’s $3.3 million. I wouldn’t re-sign Hansbrough, either. Louisville power forward Montrezl Harrell is projected to go 20th overall to Toronto according to NBAdraft.net. Take him and let Tyler walk. 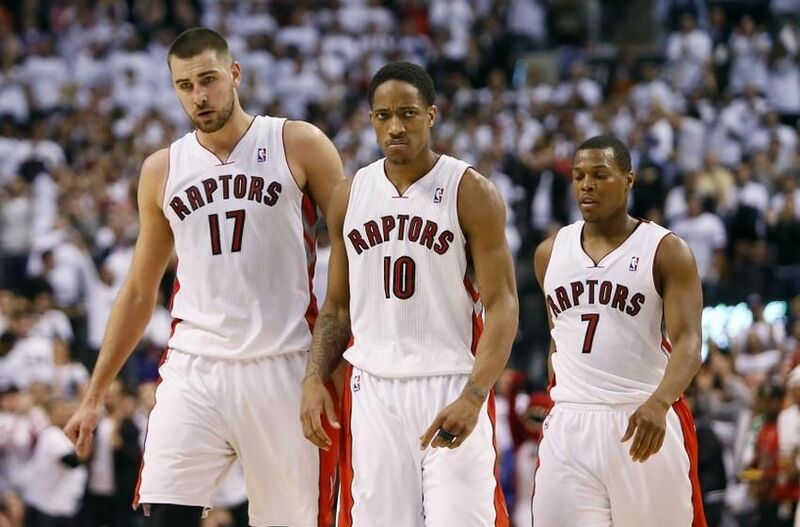 This team needs Terrence Ross to step up. The former eighth overall pick in the 2012 draft has shown almost nothing in the way of progress. I would strongly consider bringing him off the bench again and have him try and replace the Lou Williams production from this season. If the Raptors draft Harrell, sign Greg Monroe and move James Johnson into the starting small forward spot, this could end up being somewhat of a deep team. They would still need to add a shooter in my mind, someone like Marco Belinelli or Gerald Green could be a nice fit for Toronto, and not necessarily an expensive one. It may not be a championship contending team, but despite some of the cap flexibility Toronto has, they’re still locked into Lowry and DeRozan so they’ll continue to be key components. But this is a roster that now goes ten-deep with a very productive bench in my mind. Caboclo and Nogueira are both very raw first-round picks and still complete projects for this organization, but if they can turn out to be anything they’re expecting them to be, the tune of this franchise can improve rather dramatically in the near future. Another key potential change for this organization is the head coaching position. Dwane Casey, much like Monty Williams, would not be my first choice as a head coach. He just completed his fourth season as the team’s head coach but I feel like I haven’t seen much improvement with some of his players. DeRozan obviously made a jump, but he was the ninth overall pick, he was supposed to improve. Guys like Terrence Ross, Amir Johnson and Jonas Valanciunas. All very minimal steps in their game. A good head coach is supposed to get the very best out of his players. I’m not so sure Casey has been able to do that wit his guys these past four years, despite consecutive playoff appearances. And with those appearances came first-round exits as the higher seed each season. I believe Casey has gotten this team as far as he could take them. It may be time to explore some more options if you want this franchise to take the next step.